In an effort to distract Iris from the revelation that she tried to depower their daughter in the future and the increasing tension between her and Nora, Barry asks Iris for help in tracking down a disturbing new metahuman criminal called Rag Doll. Meanwhile, Caitlin discovers a startling secret about her father. Gail Simone's run on Secret Six (character of Rag Doll) and the Cold Comfort episode of Batman: The Animated Series. Rag Doll robs the mansion at night, seemingly in the early evening, but it is day when Barry is seen investigating the crime scene. How does Nora think she's assembling the crib without any screws or pegs? She may be quick to act and slow to think, but she's not that stupid. Who called in the bomb threat at Seaver Architecture to the police? Troy James is a wonder as Ragdoll - not only for his talent of contortion but also for how he captures the playful yet twisted nature of the character from the comics. From the moment you see him silently try on the necklace he is stealing, you know they perfectly captured the essence of Gail Simone's creation. To give the writers credit, they do come up with a valid reason to keep Cisco from using his powers from solving the mystery of Caitlin's missing father or who Cicada is and cleverly show why that isn't an option while giving the detective heroes a chance to show off and allowing us some nice character moments. Well done. The first version of Rag Doll first appeared in Flash Comics #36 (December 1942). The son of a carnival barker, Peter Merkel found work in the circus as a contortionist thanks to his being born with a rare condition that made him triple-jointed. Unfortunately, hard times caused Merkel to be let go by the circus and led to his perusing a unique career as a criminal. Dressing as a giant rag doll, Merkel would arrange to be set up in different toy stores and department stores as a display and then rob the shops at night, trusting in his outlandish costume and erratic movements would discourage police from believing reports that a giant rag doll was robbing the store. Soon, Merkel would begin pulling his scam by having himself delivered as a gift to rich families with children and start robbing whole mansions. The Jay Garrick Flash eventually brought Merkel to justice. Merkel had several children who took up his legacy. One of them was an unnamed son, who inherited his father's triple-jointed condition, and had his blessing to use the Rag Doll name. Another son, Peter Merkel Jr., did not inherit his father's power but had a series of experimental surgeries to replicate the effect, though this left him horribly scared - physically and mentally. Peter Merkel Jr. used the name Ragdoll (one word) and was a member of the Secret Six, first appearing in Villains United #1. Merkel also had a daughter named Alex, who went by the code name Junior, and became one of the most heavily feared crime bosses on the West Coast of the United States. The Arrowverse version of Rag Doll wears a costume based on the Peter Merkel Jr. version of Ragdoll, but his name is Peter Merkel. Unlike his comic-book counterpart, he is a meta-human, who gained the power to contort his body on the night of The Enlightenment after being crushed under debris. He seems to have limited ability to reshape his bod, pounding his hand into a flat shape with no apparent discomfort to use it as a lever on a locked box, but he cannot shape-shift at will like Elongated Man. He is durable enough to survive a skyscraper being bombed into rubble. He is revealed to be the son of a noted billionaire named Theresa Merkel. 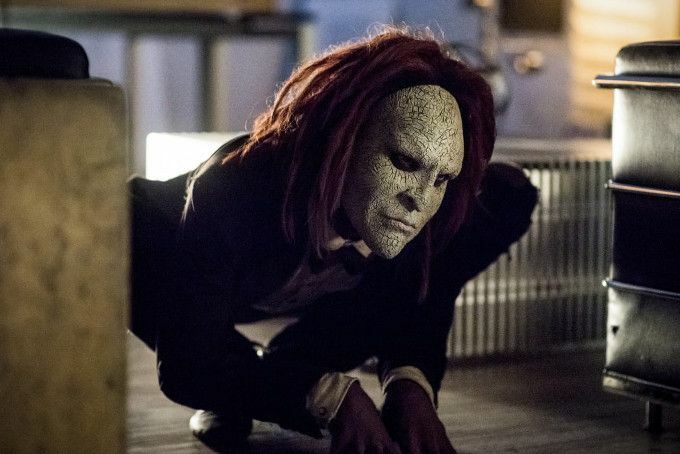 The Arrowverse version of Rag Doll is played by contortionist Troy James. His voice is provided by Phil LaMarr, who has voiced many other DC Comics characters in animation, such as Aquaman, the John Stewart Green Lantern and Static. Cecile offers to tell Nora about Barry's encounter with a race of golden giants in an alternate past called the Grodans. First appearing in The Flash #120 (May 1961), the Grodans were discovered by Barry and Wally West when an earthquake combined with Barry's vibration accidentally sent them into the past. When Cisco sees the formula Thomas Snow was working on in his vibe vision, he says it looks like the formula for heavy water. In the classic Flash Comics, Jay Garrick gained his super-speed following an experiment that involved heavy water. When we first see the architect whose building is destroyed he is on the phone with someone named Novick in Gotham City. This may be a nod to Irv Novick - a classic Batman artist. Rag Doll's motivation for his crimes is revealed to be stealing or destroying the things people value most so as to inflict as much suffering as possible on them. This is similar to what Mr. Freeze did in Cold Comfort - an episode of Batman: The Animated Series where Mr. Freeze committed a series of crimes purely to destroy the things people treasured most, such as an artist's greatest work, a priceless dinosaur skeleton, an elderly woman's beloved dog and the orphaned Bruce Wayne's foster family. When Rag Doll kidnaps Barry, he takes him to the roof of the Eaglesham Apartment Building on Simone Avenue. This is in honor of Gail Simone and Dale Eaglesham - the comic book writer and artist who co-created the Peter Merkel Jr. version of Ragdoll. Cisco re-purposes The Thinker's four other satellites for STAR Labs' use, naming them Robby, Hal, Colossus and Data. All of these are the names of famous artificial-intelligence from science fiction. Robby was the name of the robot in Forbidden Planet. Hal was the treacherous ship's computer in 2001: A Space Odyssey. Colossus is a nod to the advanced defense system that becomes sentinent in Colossus: The Forbin Project and Data was an android who was part of the crew of the USS Enterprise on Star Trek: The Next Generation. Sherloque claims to have developed a complex formula involving the terminal velocity and weight of the STAR Labs satellite and the velocity of Barry and Nora when they impacted with the satellite that allows him to chart the shrapnel patterns and determine the perimeter of the area in which Cicada must have been when he was empowered. The necklace Ragdoll steals is made of flawless ascher-cut diamonds set in platinum, with over 383 karats. Cisco describes Thomas Snow's formula as hydrogen chains bonded over and over to oxygen at Absolute Zero. The numbers in the formula correspond to the periodic table numbers of several elements, spelling out the word "KHIONe". Khione is the name of the Greek goddess of snow. She was a daughter of Boreas, the north-wind, and Oreithyia, the lady of mountain gales. The hair Barry found at the crime scene is human, but he can't get a DNA signature off of it. The strange markings Barry found at the crime scene are revealed to be Ragdoll's finger prints, also stretched out of shape. Liquid nitrogen is a potent accelerant. Caitlin says that there are still trace amounts of aluminum-beryllium alloy in Cisco's wounds. Every time he tries to use his powers, it will cause him more and more pain. Cisco is able to take control of The Thinker's four satellites, working around the multiplexed burst-model channels and the inter-SV hand-off. Caitlin: (skeptical) And that took you how long? Sherloque: Oof, Dr. Snow! 18 hours, because I am only semi-excellent at algebra. Cisco: (deadpan) You know this is calculus, right? Barry: You are nothing like that woman in there! Iris: Are you sure, Barry? I mean, I love our daughter with all my heart, but she hates me...because I turned my back on her, just like Theresa Merkel did to her son. I lied to her about everything that she is and I prevent her from living the life that she deserves. (pauses) I'd hate me too. Barry: Iris... you are never going to be the person that Nora knows from the future. Iris: That's the thing. It's not even up to us. I've already become her and I didn't even have a choice. Cisco: I remember when these powers were a curse. Seeing Thawne kill me over and over. Knowing that darkness. I didn't want that. I didn't want to be a hero.These powers were a part of me. I had to learn that. And when I did, they showed me everything. I could vibe every clue. I could breach us wherever we needed to go. I could being my value to the team! (pauses) If I can't take the pain, that means Cicada wins. Cisco: It's going to take me at least an hour to fix it. Iris: Cisco, we don't have an hour! Ralph: No, but we do have me. Ralph: Let's go save the Flash. Sherloque (quietly, honestly awestruck) Mon Dieu, that was inspiring. Ralph: (jumping off the Eaglesham building) I hope I don't land on my keys! This episode takes place two weeks after the events of 504. Barry and Iris haven't seen Nora for two weeks. Nora catches the thief who hits the art gallery and steals a Monet but fails to stop his motorcycle from going out of control. Luckily, Barry is able to save the pedestrians who are almost hit by the bike. Cisco says his powers aren't working fully due to his injuries but he can still touch an object to determine its links to a person. He touches the letter with the coded message Thomas Snow left Caitlin and sees him working in an office, sketching something in a notebook. He also saw equations on a black-board and a work ID with a yellow logo. Sherloque recognizes the logo description as being Hudson University, where Professor Stein once worked. Caitlin says her father was an admirer of Professor Stein but she had no idea they worked together. Cisco seems to be hiding a pain in his hands. Caitlin has a key to Professor Stein's old office at Hudson University. It was given to her by Stein's wife. She didn't know that Professor Stein and Thomas Snow knew each other either. Cisco vibes the blackboard in Stein's office and gets an impression of a formula. He thinks it is for heavy water at first, but Sherloque identifies it as ice. Cisco vibes the picture of Khione and sees Thomas Snow in a place called Viera Chemicals. Caitlin identifies this as a chemical lab out in The Barrens district of Central City. After Cisco does this, the wounds in his hands repopen. Barry identifies Ragdoll as Peter Merkel, who has a criminal record for breaking in and entering. Viera Chemicals is revealed to have caught on fire the same day Thomas Snow disappeared. It was declared an accident. Given the size of the facility, Sherloque and Ralph both agree there's no way Thomas Snow could have burned it down to cover his tracks without help. Cisco tries vibing the box at Viera Chemicals, only to develop a nosebleed and pass out. Theresa Merkel says she hasn't seen her son in two years, since he was arrested breaking into his own house and the police were called by her staff while she was out of town. She coldly says that she gave him a wing to play in and sent him to the finest schools and he was not at all appreciative. Barry recalls he and Iris never really had a first dance at their wedding in S307. Caitlin finds that bits of Cicada's dagger are in Cisco's wounds and they are causing nerve damage every time he tries to use his powers. Barry makes reference to Iris' mother and how she left her family to protect them from her mental illness. Cecile tells Nora several stories about Iris as a child, saying they were about Barry. Nora finally figures it out when Cecile tells about a boy who lost his folks and was picked on and how "Barry" had lunch with that kid every day for a year and wound up devoting a page to him and his science fair project in the yearbook. Nora knows this because Barry didn't work on the yearbook in school, but Iris did. One of the stories about Iris involves her keeping singing despite some unspecified disaster during a middle school production of Guys and Dolls. Cecile shows Nora one of the West family picture albums. Iris guesses that Rag Doll is stealing the things that are most valuable to the victims.. In this case, a priceless family heirloom and an architect's prize-winning building. This leads to Ragdoll kidnapping Barry - the thing that matters most to the reporter investigating him. Sherloque broke Cisco's extrapolator trying to use it. Future Iris never told her daughter about her past. Iris exposed a corrupt teacher at the age of 15. In the third grade, Cecile staked out a girl's bathroom to prove the janitor was not cleaning it. Ralph and Sherloque deduce that Thomas Snow is probably in a Tannhauser black ops site. Caitlin says her mother's company had dozens of black-ops sites and safe houses used to test pathogens for the CDC. Cisco repurposes the four satellites launched by The Thinker for STAR Labs. Barry apparently traveled to an alternate past and encountered a race of golden-skinned giants called The Gordans. We don't get to see the actual fight between Rag Doll and Elongated Man. Sadly. Ralph Dibny gets no respect. What could have been a moment to show Ralph coming into his own as a hero and developing an arch-enemy is lost in the name of a cheap gag (i.e. Ralph apparently swallowing Ragdoll to contain him). And Ralph rightly points out that he took down the bad guy while everyone is lining up to praise Iris for jumping off a building to get Barry the key he needed to unlock the cuffs shutting off his powers so he could save them both. There's a lot of interesting things in All Doll'd Up. Unfortunately, almost all of them are secondary to Barry and Iris making goo-goo eyes at each other and Iris learning not to be a control freak. At least this time the lesson seems to stick, so hopefully we don't need to retread this territory again. Cisco's desire to prove his worth is more touching. Ralph and Sherloque jockeying for position is more amusing. And strangely enough, Caitlin seems to be a secondary character in her own plotline, with all the other characters helping her find her dad. Ragdoll, one of the more interesting villains to come out of DC Comics in the past 15 years, doesn't get much of a chance to shine either. All in all, this isn't a bad episode, but much like its titular villain, it doesn't quite stand up properly or move smoothly.